rollredroll had the most liked content! I'm going to address this is as diplomatically as I can: "Hurt"...As I've said multiple times now, I had no one-sided tie to this game. A victory by one team is a feather in one's cap for one of my children and not for the other, and yet both, to their credit, of their lives today are no better nor worse today than they were 24 hours ago before the outcome. Same goes for me. "Thin-skinned"...Of all the people who made predictions of this game - and if we're going to be technical, I never even predicted the outcome; I just acknowledged someone else's assessment of the game on paper and piggy-backed it with caveats ("if this", "if that") - you quoted my post. If I don't respond, someone will inevitably call me out for tucking tail and hiding. It's a no-win situation. So, I responded. And from that response, the main takeaway is I said "I was wrong". I'm not going to reread all the posts in this thread, but I don't recall many people acknowledging their incorrect prediction after the fact, nor anyone individually being called out for it (heck, Spotlight himself, whose post I piggy-backed, was at least given credit for his opinion that CPA could win this game 1 out of 10 times). So, as to the thickness of my skin, whatever thickness that is - taking accountability when singled out, asking jett about where I showed "past issues" (to which he has not responded and will not be able to, because nowhere in my post did I show any, even acknowledged by a third party (bcd) himself), etc. - I'm comfortable in it. If you want to call out someone for the thickness of one's skin, that's fine, but it certainly begs the question of the thickness of your own when you single out a particular person when there are multiple targets that could be called out for the same predictions/pre-game analysis. "Get the praise" - I don't predict (chime in) for praise or ridicule. I'm an analyst at heart and like the study of the game. I don't think you'll ever find a post of mine where I have taken credit for predicting/chiming in correctly on the eventual outcome of the game. I don't mean to sound snarky, but I'll post when I want to post, defend my position when questioned, and call people out (in this case, jett) when they throw unsubstantiated accusations at me. Still, the tenor of the these boards has "jettisoned" (ironic word, huh) many of us old-timers off them from a posting perspective. This thread is not very encouraging, to me at least, that things are much different. I have plenty of issues, and none of them have to do with the outcome of high school football games, past or present. Show me where I said anything about how CPA players from two years ago felt about the 2015 loss and how they did or did not move on from it. Again, I have a child that went to CPA. To infer I have anything against CPA is asinine. I love that school and the people associated with it, on and off the field. This thread is quickly serving as a reminder of why I have largely stayed off posting on the message boards, with the unfounded attacks that people inflict on others. Maybe I should practice what I preach and remember the past when it comes to expressing opinions on these message boards, because it certainly looks I am condemned to repeat it. "Those who cannot remember the past are condemned to repeat it." Maybe Ingle used the past partly as a learning tool and motivation to turn the tables on his old ball coach in the present. I made a prediction - and one similar to many people who posted and many others who didn't stick their neck out - and was wrong. I own it. I was wrong before and will be wrong again. If I had a dog in last night's hunt, it was at best a mixed-breed. I am an alumnus of the two coaches alma' mater, a parent of an alumnus of one of the schools, and a parent of a current student at the other school. If anything, I am happy for the child who has had to endure two years of being on the wrong end of this game the past two years. I shared a funny little .gif file that hope is used in inflicting reciprocal grief on the other child. To use a less intellectual quote, "what goes around comes around". Happy for CPA (and they are better than the 2015 team). I think Spotlight is on point with his assessment of this game. Looking back on the 2015 game at Ensworth, CPA had a decent chance to win that game. That Lions team, which I think was just as good if not slightly better than what the 2017 team on paper will be, attacked Ensworth, which probably had its relatively weakest defensive team to date, head-on and downfield in the first half and went up 14-0. In the second half, CPA tried to shorten the game, mainly by running QB Weatherly sideline-to-sideline in the second half, which Ensworth snuffed out fairly easily with its speed on the ends. And thus, a 14-0 CPA lead turned into a 24-14 Ensworth lead late in the game. In catch-up mode, CPA had shots downfield late in the game (I remember a CPA WR dropping a perfect pass down the middle late that could have been a long catch-and-run for a TD that would have at least given them a chance at an onside kick opportunity to make the outcome interesting) that I think they would have had throughout the second half as well. That's the thing with Ensworth, and any well-coached team for that matter - if you get the rare chance to get up a couple of scores on them early, you have to keep the foot on the gas, or Ricky will adjust and make you pay. Two other games in particular stand out on that front - BA at Ensworth in the 2010 playoffs, and MUS versus Ensworth in the 2013 title game. BA and MUS were in full control for both of those games but didn't put the Tigers away, and Ensworth turned what look like inevitable defeats mid-third quarter into fourth quarter victories. 2017 Ensworth is markedly better than 2015 Ensworth; unless 2017 CPA is markedly better than 2015 CPA, I see a 3-TD Ensworth win here. I think CPA will represent just fine, but it's going to be hard to match Ensworth score-for-score. I run that site (alone). I do make a mistake every now and then keying in thousands of scores and teams. I will revisit my files and fix the issue if I can determine the team that should have been the opponent in that game. My sincerest apologies. Update: D-B's opponent in 1928 that it beat 61-0 was Doak High School. Thus, I will make the change in the database tonight. Also, will change Oak Ridge's 1960 record from 8-1-1 to 8-2 as they lost to D-B that year. Those changes will put the series at 21-18 Oak Ridge's advantage in database. Short write-up on MBA-Henry County scrimmage available here. To each his own. Get 10 people in a room and you will likely get 10 different answers as to what the greatest game ever is. â€œGreatest game everâ€ is just as subjective as â€œgreatest team everâ€. Whether a defensive stalemate or offensive shootout makes a better game is equally as subjective. 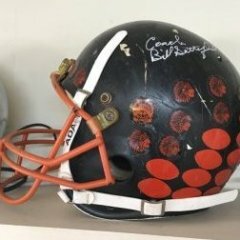 In another thread, you mentioned you have been broadcasting for over 30 years, so Iâ€™m sure you have some sense of the trend in high school scoring during that time, at least in Tennessee, and likely in many places across the country. Here are the average combined score totals for Tennessee high school football championship games, by decade, in the past 30+ years you have been broadcasting: 1980-1989: 30.4 1990-1999: 39.2 2000-2009: 43.7 2010-2014: 52.2 Thatâ€™s a 3+ TD difference (or 72% difference) in average combined scores of championship games over your decades of broadcasting. And while this decade is not complete, I think we all have a good idea that the trend of higher scoring will continue. Offenses in general are more sophisticated and outpacing defensive schemes, plain and simple. The only Tennessee championship game I have ever heard referred to as â€œgreatest championship game everâ€ is Bradley Centralâ€™s 3OT win over JCM 50-48 in 1976 â€“ 98 total points. Again, whether or not that is the greatest championship game ever is subjective. Maybe Overtonâ€™s 3-0 victory over Rhea County in 1981 â€“ the total of three points scored is tied for the lowest in TSSAA championship football history â€“ is the greatest championship game ever. Or perhaps Hillsboroâ€™s 10-7 victory (17 total points scored) over Maryville in 2008, breaking MHSâ€™s 74-game winning streak, is the greatest championship game ever. Pick any game. I donâ€™t know what the greatest championship game ever is, but the implication that this BA-MBA one should not be considered because the offenses ruled is pretty short-sighted in my opinion. But, with 30+ years of broadcasting experience, youâ€™re probably at an age where you are â€œold schoolâ€ and miss defensive-minded teams and games. Thereâ€™s nothing wrong with that â€“ I played in that 1980s era, and in my senior season, it took our opponents 40 quarters (10 regular season games) to score a total of 21 points. We were proud of our defense â€“ 7 shutouts and 3 opponents scoring 7 points each in the other three games â€“ but in the end, it was always about the â€œWâ€. And, Iâ€™d say when it comes to wins and losses, teams then and now will take the â€œWâ€ every time, regardless if itâ€™s 3-0 or 56-55. I'm not sure if he's being recruited or not. However, I did just read on the AP wires that he has been asked to be a keynote speaker at various football officials association meetings next year across Tennessee to address how not to make a mockery of coin toss rules. Seriously, it was a great game, and the game and players themselves should be talked about, but that overtime coin toss snafu, all caught on audio, was as laughable as it was pitiful. I wish someone with YouTube or other video skills could post that on here. Was it a game changer? Not in the least; I want to emphasize that, as it did not affect the outcome of the game at all. I realize officiating is not easy, and is a low-paid, thankless job that subjects oneself to a lot of scrutiny that I frankly certainly would not want. I am fine with judgement calls in high school football - they have to be made in the heat of the moment, there are not as many angles (and none are re-playable) to make a call - and in the end I think they generally even out in any given game for any given program over the lifetime of the program. However, lack of knowledge of rules, especially in a finals game where supposedly the best crews are calling games, is not excusable. With that said, I do feel sorry for that official. I'm certainly not trying to pile on by wanting to see that video again, but I think others seeing that may even send a message to some coaches who might want to bone up on their knowledge of the rules to help prevent such confusion occurring in their games. I'm out of here for now (I think); I hope I'm not sucked in again! But again, a great game with a lot of excitement and great sportsmanship shown on the field. And for anyone who wants to diminish the defenses in that game as a means of downplaying the overall talent of either team, have at it. Ensworth beat MBA 50-44 in the regular season in 2014 and MBA beat Ensworth 10-7 in the 2014 finals. I'm sure I can find posts somewhere saying there was no defense skill shown shown in the regular season and that there was no offensive ingenuity in the finals. The hypocrisy on these boards is what has caused the relative crickets over time on the DII boards. No worries; I know you all are tired of hearing it. Just wanted to keep the discussions equal. Painful, but a game for the ages. Hats off to the Eagles. Proud of the Big Red. Good; hope you're doing well, too. I haven't posted in almost two years - and that includes a state championship I avoided rejoicing last year - and it's been the best enjoyment of high school football I've had in awhile. Maybe it was the early start on beer this afternoon that drew me in today. I hate that I'm back in, but I'm going to step out quickly! Best wishes on Saturday. It's your game to lose but I know the Rebs approach all games with the same mindset of respect and preparation. I hope everyone keeps it civil in the offseason. I will be silently observing! My days of getting into petty debates are long over - heck, I haven't posted on any topic in the past 22 months until tonight - but this is the type of "IFL" commentary that is rebutted with such vitriol when it goes the other way. Just trying to keep the dialogue consistent. I F.....g Love this post. I was thinking of a name change that begins with the same first two letters...and it's not "punks". Let's just say that nickname in the Russian music world would be considered a "riot".